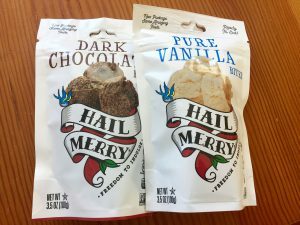 We were thrilled to find Hail Merry bites in our local natural foods store and promptly bought one of each flavor available. We began sampling the Dark Chocolate and Pure Vanilla. 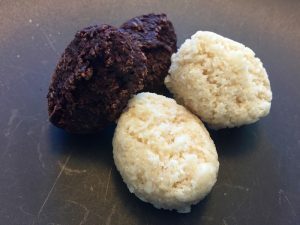 These little bites are about the size of huge cotton ball and have the thick, slightly crumbly texture of macaroons (coconut lovers, rejoice! but if you don’t love coconut, these snacks are probably not for you). The Dark Chocolate has a flavor true chocolate lovers will appreciate — that of deep, rich cocoa. The coconut texture is there, but this bite is all chocolate. The Pure Vanilla is very coconutty (not a problem here, but if you don’t like coconut you may not enjoy these). There’s no discernible vanilla flavor that we could taste, but they are nonetheless a big treat for coconut and cookie lovers.